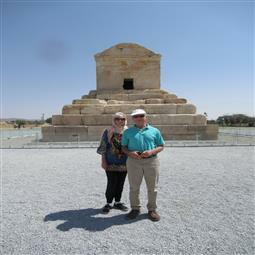 Travel To Iran| Happy Cyrus the Great Day! Happy Cyrus the Great Day! October 29 called Cyrus the Great Day. Cyrus the Great, was the founder of the Achaemenid Empire. He created the largest empire the world had yet seen. Cyrus the Great respected the customs and religions of the lands he conquered. This became a very successful model for centralized administration and establishing a government working to the advantage and profit of its subjects. Cyrus the Great is also well recognized for his achievements in human rights, politics, and military strategy, as well as his influence on both Easternand Western civilizations. Having originated from Persis, roughly corresponding to the modern Iranian province of Fars, Cyrus has played a crucial role in defining the national identity of modern Iran. Cyrus and, indeed, the Achaemenid influence in the ancient world also extended as far as Athens, where many Athenians adopted aspects of the Achaemenid Persian culture as their own, in a reciprocal cultural exchange. Tomb of Cyrus in Pasargade, Fars province, Iran is one of Iran's heritage sites listed in UNESCO and many tourists visit it every day.